The first time that I experienced snow — which was just 2 years ago — I was in complete and utter bliss. But for as soon as that happiness came, a huge wave of sadness overwhelmed me when I realized how us ‘tropics people’ have been missing out on such a magical thing for the majority of our lives: the change of the seasons. …Still and the same, that didn’t keep my spirits down for long. As we all say, it’s better late than never. That’s why from that point onwards, I made it a point to simply enjoy the wintry seasons and to try as much winter activities as I could. So when Visit Helsinki invited me over to their #HelsinkiSecret residence last February, you could imagine how incredibly elated I was! Besides, one of the activities that they offered was an amazing snowmobile safari with Burn Out City Events. In all actuality, I could have done this winter experience alone, and Jonas himself urged me to just go since he felt bad for delaying things; however, I really wanted to share this with him — besides, happiness is best when shared, right? So: I did my best to nurse Jonas back to health. End result? We managed to do the snowmobile safari experience on the 5th day! And how did it go, you ask? …Astonishingly epic. Plus, I’m glad that I have been able to share this experience with my best friend. At 9AM, we were picked up from our apartment hotel in Aallonkoti by our contact person from Burn Out City Events. His name was Henrik and he was a warm and interesting fellow (who, mind you, had a great Nordic accent). He told us that the safaris were arranged in a municipality called Sipoo which was just approximately 30km east of Helsinki. It would take us half an hour to get there and I didn’t mind it at all especially because Henrik was great to talk with as he shared a lot of facts and stories of his life in Helsinki. Occasionally, he would also happily mention how perfectly “thick” the ice was that day for our snowmobile experience. The first time that he mentioned this, it quickly dawned on me the reality of what we were about to be doing soon… and that made me jittery. Besides, I still couldn’t wrap my head around the idea that a layer of hard ice on top would really keep us and our heavy snowmobiles from sinking to the bottom of the sea! This might come as ‘common knowledge’ for you guys who have experienced winter in your lives, but not for me, so it was still such a foreign concept. We finally arrived at their center and I noticed how deserted the place was. “Hey Henrik, where are our safari companions? Are we the first ones to arrive?” I asked. This was news to me — and a good one at that. I really thought we were going with a group, but now that it was just going to be us and ‘them’, I had visions of how amazingly personalized this safari would be and that made me even more excited! At this point, Henrik introduced us to our guide who was a cheery lad named Kenneth, and we knew that we would love “Kenny” as our companion for the day when he made a South Park reference the moment that he introduced himself. After a little bit of chit-chat, it was time to change into proper clothes. When it comes to Burn Out City, be assured that you will never have to worry about bringing the right clothing and gear for this snowmobile safari experience because they will provide everything for you! 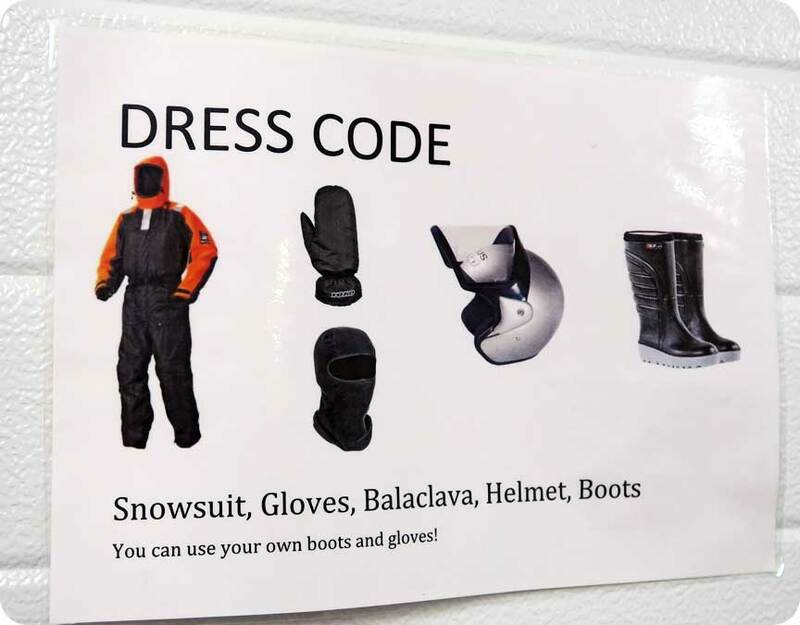 So yes, you can keep your clothes on you and they will provide the rest: snowsuit, gloves, balaclava, helmet, and boots to protect you from the cold and the snow. Everything comes in different sizes too; therefore, there’s always going to be a match for you. If I may note, the remarkable thing about their snowsuit was that it kept me warm and well even if I was only wearing pants and 1 sweater underneath. Kenny pointed out as well that this snowsuit serves as a life jacket in case of accidents or emergencies. Like let’s say, worst scenario: the ice breaks and I slip into cold water, he told us that their snowsuits will not only keep me dry but it will also make me extremely buoyant. I was told that one of the common problems of falling into ice is that it can be quite hard to pull yourself out of the water; but since these suits float up so high, you can easily push yourself out of it and towards safety. Now this is not to say that we will fall, they never had cases of such things since they always make sure that the ice is thick enough for snowmobiling anyway. To prove this point, once Jonas and I were done changing, he took us outside while he lugged along with him some sort of gigantic metal drill (which I found out later on was called an ‘ice auger‘). I followed him and mindlessly watched as he started drilling through the ice that we were standing on. Yep. I think I’ve watched far too many movies. My apologies again: I’ve never dealt with these wintry things in my life, until that day. But then of course everything went well, and when Kenny pulled out the auger, he showed us how thick the ice was that day: around 30cm! No doubt about it: it was safe. Clearly, this was a routine that was done by them to appease any tour participants (like me) who might have some concerns — and it worked, because my fear did subside at that point. Additionally, it was also great to learn more facts about such things and lessen my ignorance with the help of Kenneth since he was an experienced and knowledgeable guy (he has been doing this for years and have lived in Helsinki for all his life, anyway). 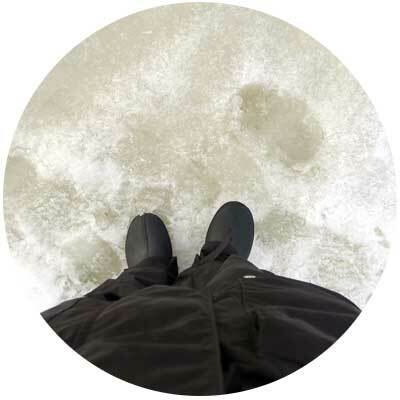 FYI: Another one of the things that got me nervous was that when I walked on the frozen sea, my feet would sometimes go through the snow and make a squishy sound as if the ice is already melting and pulling me down to the depths… and when I look at it, they look so wet. (I had ghastly thoughts of going right through the crack and under the cold sea). Kenny explained to me that that’s because there’s fresh snow on top that’s melting, and that I shouldn’t worry because beneath that is the harder not-so-easy-to-melt 30cm ice that we drilled into. This was followed by a string of scientific explanations which made absolute f*cking sense to me, and I just felt a bit foolish for being a bit too paranoid. If you’ve driven a jetski before (Jonas and I both have), you will find that a basic snowmobile has the same features: an engine starter, an engine stop switch, the throttle on the right (to pump gas in and make it move forward), and the brake on the left. It’s really that simple! When it comes to making sharp turns though, it is best to lean into the turn that you’re making. This means that if you’re turning right, you must lean your body to the right to make the movement easier. Pushing the throttle might seem scary at first, especially when you hear the gas pumping loud — but don’t fear, and don’t hold back when pushing it, otherwise… you really won’t move. When making a turn, don’t be afraid either of leaning towards where you’re heading: left or right. You won’t fall as long as you keep your feet on the snowmobile’s foot area. (The snowmobile is a big chunk of metal too, so it won’t fall either on you. You just need to lean to make the ride smoother, and to avoid getting stuck as well). As a beginner, it’s best to ride your snowmobile on trails that have already been traveled in. Venturing out into fresh snow might get you stuck if you’re not experienced enough. Typically however, Kenny or any other Burn Out City Events’ guide will be riding ahead of you on the trail, so you will only need to follow them. TRIVIA: Burn Out City Events uses Yamaha Venture Lite 2013 snowmobiles in their snowmobile tours. These are specially made for safaris and are equipped with fully automatic engines, which make them nice and easy to drive. They may be powerful, but they are environmental friendly due to low fuel consumption — a fact that was nice to know! Our agenda for this expedition? Spend 4 epic hours exploring the snowy safari and the frozen archipelago as we make stops along the way…. and so off we go! Jonas LOVED to drive the snowmobile, most especially when Kenny gives him the signal that he can go faster than normal. One thing that you should know about the Finns is their immense love for saunas! 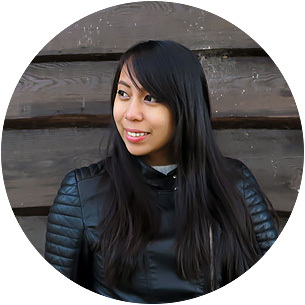 It has become a substantial part of their culture, not as a luxury but more of a necessity. During our snowmobile riding spree, Kenny made sure that we witnessed a typical type of sauna which uses wood stove. As you see in the photos below, this stove has stones on top that are heated by burning birch wood that have quality smell and long-lasting burn. When the stones are hot enough, water is thrown at it to create steam while naked bathers sit on the high benches on the sides (it needs to be high so that the steam reaches the bathers quickly). Once the heat becomes too warm, Finns would then jump into cold water — which is in this case, the icy body of sea water that has been cut out off the frozen ice. Yikes. Some Finns would even roll in the snow. This cycle of heating and cooling off one’s self is repeated until the person is satisfied (usually at least 2 or 3 cycles) and it’s said to have a lot of health benefits: relieves stress, flushes toxins, cleanses the skins, soothes muscles, burns calories, improves circulation, etc. During this Helsinki trip, we experienced a Finnish sauna beforehand in the city which uses modern electric stoves, and instead of jumping into natural ice cold water, we just took a cold shower. I guess I’ll save the rolling-around-the-snow and/or jumping-into-icy-water for next time! I was born in a tropical island and I realized that I’ve never tried fishing hands-on before — that was mostly done by my father, but I did get to see him do it one time (as well as my relatives). So when Kenny asked if I wanted to try ice fishing, you bet I said yes! So what is ice fishing? As the term suggests, you fish through the ice via a hole on a lake, sea, or river. Most people catch fish with lines and fish hooks, but apparently some also use spears (now that sounds incredible). For this day though, we’re settling for the good ol’ line and hook. Kenny started to drill a big hole on the ground with his auger and proceeded to teach us how to fish. If I may share with you, I felt a bit queasy trying to puncture a live worm with my hook… it was tough. To cut this story short: my wish of checking “caught a fresh fish by me self” on my bucket list did not come true. (Jonas did have a fish though that mightily tugged on his line and ran away with the worm. Still no fish for either of us). …because behold, there is warmth and F O O D ! I was starving so you could imagine how happy I was when Kenny started preparing typical Finnish fare. Sausages were served (naturally) and what followed was a good cup of non-alcoholic glögi (mulled wine with spices). The particular bottle that he gave up was a concentrate which we had to dilute with hot water, and oh goodness gracious… it was such a perfect drink match-up for the freezing Helsinki weather. Kenny also served us salmon on bread which had this DIVINE pepper-and-lemon combo. To finish off the meal, he introduced us to leipäjuusto, a Finnish ‘squeaky cheese’ which instantly became my favorite! This was an oven-cooked fresh cow’s milk cheese and it was paired off really well with cloudberry jam (lakkahillo). Aaaah… simply recalling this moment is almost making me cry! (I badly want to eat this cheese again). After lunch, we had a swell time exchanging stories and we got know Kenny better too! It was awesome to hear that he once went on an expedition to Antarctica, making me recall my fervent wish to be able to do the same — but his stories of how high the waves were at one point of their trip didn’t really appeal to me. But let’s save that ‘fear’ for later when I’m actually on a boat to the south of this globe. As we packed and cleaned, we continued our journey as we cruised by more terrains (with Kenny giving Jonas the permission to ride as fast as he wanted to!). But by this time, it was already some sort of a ‘last hurrah‘, since our time was up. Needless to say, I treasured every second of it. You could also watch my vlog below to get a ‘deeper’ glimpse at our experience! Venturing out into a blinding white wilderness on a snowmobile was every bit as magical as people claim it to be. This was, without a doubt, one of those travel experiences that I would forever hold dear and I have Visit Helsinki and Burn Out City Events to thank for it! And of course, this is one of those things that I highly recommend that you should try. Booking & Prices: Burn Out City Events website (they speak English, Finnish, and Swedish). Where to Stay: Check by Booking.com for the best deals on other hotels, inns, and hostels in Helsinki! 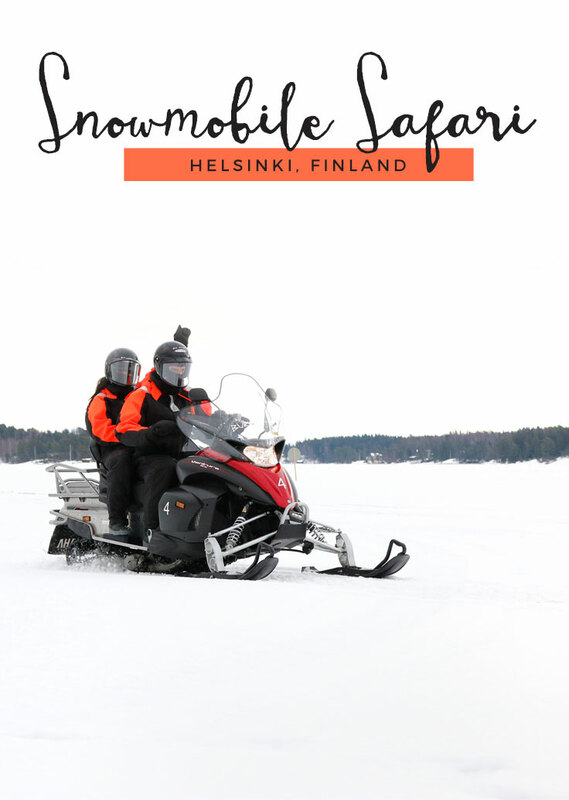 Would you like to try a snowmobile safari experience? Helsinki is on my list to go to next year. Lots of people have told me it is amazing, and you're story confirmed that I need to go! Oh you won't regret it Zoe! What a neat experience! I've always wanted to go snowmobiling!